This piece, Spring Refresh: DIY Botanic Hair and Scalp Care, originally appeared in the Spring 2018 issue of Paprika Southern. To see this full feature in print, along with our tips on how to begin a lifelong art collection, an exploration of the legacy of iconic southern photographer Jack Leigh, a floral and citrus-infused brunch with recipes, and much more, order a back issue now. In a world of complexity, busy schedules, and an overwhelming amount of beauty products, sometimes we need to return to our roots and create more simple self-care routines. Spring is the perfect season to align our beauty regimens with new and fresh botanical treatments and to awaken our tired winter bodies. Most of what you’ll need can be found in your pantry or at your local health food store. Let your curiosity and sense of wonder walk you through these three simple, effective hair and scalp treatments. Oily, limp hair can be caused by numerous factors including poor product usage or build up, hormones, stress and environmental factors. For a simple oil balancing treatment you’ll need to gather 1 organic lemon, apple cider vinegar with the “mother” and organic hibiscus tea or loose hibiscus leaves. Steep 1 tea bag of hibiscus in 1 cup of hot water; you may double this for longer hair. Once steeped and strained, add 1 teaspoon apple cider vinegar and the juice from half of a lemon. Again, double this if you have longer hair. Let your rinse cool and then pour into a shower-safe bottle or bowl. After shampooing your hair, apply the Hibiscus Tea Blend to wet hair and leave in for 5-7 minutes. Gently rinse out with cool water and condition if necessary. Hibiscus petals are vital for hair and scalp health and strength, and can encourage hair growth. The astringent nature of the lemon juice helps remove product build up and has astringent effect on scalp oil production. Apple cider vinegar helps soften, detangle and add luster to dull strands. The vinegar scent will dissipate after your hair dries. Repeat this treatment monthly, or as needed. Recovering from dry, frazzled winter hair can be a bit of a challenge. Thankfully, your pantry or local grocery store has some simple items to help bring life back into your hair and scalp. You will need raw honey (local is best!) and hemp seed and sunflower oil from the cooking section of your local market. Using a ceramic or glass bowl, add 1/4 cup organic sunflower oil and 2 tablespoons organic hemp seed oil. Reduce or increase amount based on your hair length. Drizzle in your raw, liquid honey. Start out with 1 tablespoon and increase as desired. Gently mix all three ingredients. And don’t worry if the honey doesn’t mix with the oils fully; as long as all three ingredients end up on your hair, you’re good. Before showering, apply your Honey and Oil Blend on your scalp and strands. Make sure you coat your ends well too. Pin up and leave in while you shower. After 10-15 minutes, shampoo twice and follow with a conditioner if necessary. Honey is an impressive humectant, full of healing antimicrobial and soothing benefits. It draws moisture into your hair strands, and allows it to remain there. The combination of sunflower and hemp seed oil adds intense hydration, vitamins and healthy fatty acids, which are imperative to hair's moisture-retaining abilities and smoothness. This honey and oil treatment can be used as often as you need and tailored to your liking with various essential oils. We all know the bright and awakening scent of rosemary, but did you know its one of the best herbs for increasing scalp circulation? When we promote more circulation on our scalps, more blood flows to our hair follicles. Because of this, more internal nutrients are fed into the hair bulb and more hair sprouts. Some people are sensitive to rosemary, so either use the essential oil sparingly or steep fresh or dried rosemary stems in hot water to create a hair tea rinse. Dandruff has no more worse enemy than tea tree oil. Due to its intense antimicrobial benefits and sebum controlling power, tea tree essential oil puts our scalps back into balance. Add 2-3 drops of tea tree essential oil to 1 tablespoon castor oil, apply at night and shampoo out in the morning. Feel free to add other essential oils to this blend to customize as well. Peppermint is one of my go-to’s for scalp irritation, itchiness or thinning hair. It’s not overpowering or medicinally scented, while still encouraging proper blood flow, cooling scalp discomfort, balancing sebum production and fighting dandruff. Anyone dealing with psoriasis or eczema would like peppermint oil, as its not as intense as rosemary or tea tree. Mix 2 drops peppermint oil with 3-4 drops lavender oil in 1 tablespoon castor oil for a scalp massage and to help loosen psoriasis or eczema flakes. Although this oil is notoriously thick and sometimes sticky, castor oil does an amazing job at encouraging hair growth and soothing irritated scalps. Due to its high levels of fatty acids, it nourishes our scalps and can even help promote longer, fuller eyelashes and eyebrows. Order a back copy of our Spring 2018 for much more spring inspiration! The Spring 2018 issue of Paprika Southern also features a Brunch in Bloom, an article on Savannah’s iconic photographer known for the Bird-Girl image, Jack Leigh, a guide on how to build your art collection, and much more. Each seasonal issue of Paprika Southern is filled with inspiration for creative and intentional living. 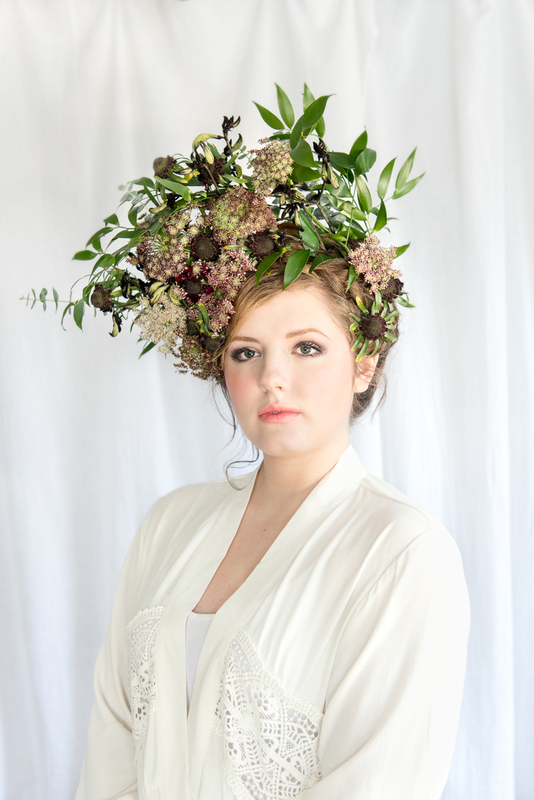 This piece, Botanic Spirit: Floral Hair Masterpieces with Wildflower Gypsy, originally appeared in the Spring 2018 issue of Paprika Southern. To see the feature in print, plus other pieces including an exploration of the legacy of iconic southern photographer Jack Leigh, spring fashion featuring the illustrations of Kristie Duncan, and citrus-infused spring brunch inspiration, order a back copy now. This spring hairstylist and creator of Wildflower Gypsy Chelsea Kester was inspired to create three botanical hair looks that epitomize what it means to be a free spirit. Her definition of a free spirit encapsulates a divinely feminine soul who can revel in her own natural beauty, and in this feature we paired this concept with beauty found in the natural world. Chelsea pulled elements from flower petals, the ben of a succulent’s arm, and trailing vines of greenery to create hair looks that flow with texture and style. Nature paints her own masterpiece with Stargazer lilies, spring roses, and ranunculus. Succulents, thistles, and eucalyptus pods accent softly flowing waves in a celebration of tonality. Spring greenery, kangaroo paws, and chocolate Queen Anne’s Lace entwine with braids to create a feminine, crowning glory. Printed in the USA, 64 pages including cover, 8.5" x 11". Subscribe to Paprika Southern for one year to receive more than 15% off the news stand price and discounted shipping! Your subscription will begin with the current issue. Your magazine will ship quarterly via USPS—ship dates are the first weeks of March, June, September, and December. Please note that you will be charged the full amount of your subscription upon ordering. This article originally appeared in the Fall 2017 issue of Paprika Southern. To see the full feature in print, as well as academia-inspired fall fashion, mid-century home decor, an enticing array of fall desserts, and much more, order your copy of the Fall 2017 issue. As more people are drawn into the green living movement, many wonder how they can incorporate these ideals into their natural beauty and wellness routines. Flowers and herbs offer many incredible and useful benefits for better health and beauty. They are readily available at your local health foods stores or online. Continue reading to learn how easily you can integrate these wonderful botanicals into your everyday lives. Hang dried lavender by your bed to help relax. Use lavender essential oil in a spray or oil to soothe irritated skin and bug bites. Combine 1/2 cup dried lavender buds with 1 cup epsom salt and 1 cup oats in a large Mason jar or container. Use several tablespoons in a bath soak to soothe itchy, inflamed skin or simply to relax after a long, busy day. Fresh or dried rose petals are a great addition to a bath soak. Rose water is a wonderful facial toner or refresher when cooled. Rose essential oil is known to help smooth skin and keep a youthful appearance. See recipe below for a simple rose facial moisturizer. Add 6 drops rose essential oil into 1 ounce organic jojoba oil for a gentle and balancing face moisturizer. You can also use it as a face oil cleanser. Drizzle a little oil in your palm, rub hands together and then massage in circular motions on your face and décolletage. Use a washcloth to gently remove oil and apply facial moisturizer if needed. Most times the oil cleanser will be moisturizing enough without additional oils needed. Together calendula and chamomile can help speed healing of cuts and wounds, calm skin irritation like eczema or psoriasis, or soothe diaper rash. Chamomile alone can be used to soothe stomach or uterine spasms and cramps. Place dried calendula and chamomile in a small Mason jar. Cover flowers with organic sunflower oil and let infuse in a sunny window for 4-6 weeks. Shake every 7 days and strain once the oil has taken a on a golden color. Store in a sealed jar or bottle, away from direct sun light. Use oil on rashes and cuts or as a bath oil. You can also incorporate this oil infusion into a salve or body butter.